Use the Employee Notice of Salary Increase Form to notify an employee of a raise. Also includes sections for outlining additional benefits, incentives, duties and responsibilities. This Employee Notice of Salary Increase Form is included in editable Word format that can be customized in Word or by using the included Wizard software. Company Name is pleased to offer you an increase in compensation for the position you currently hold, Contract Job Title, to Insert Dollar Amount of Increase, annually. List any standard or general benefits that the offer includes (health, vacation, etc. List any additional incentives, such as stock options, profit sharing, or other grants or warrants that may need explanation or qualification. Include any vesting requirements, but it is not necessary to go into great detail unless this employee's compensation is non-standard or may not fall easily into the definitions in your Human Resources Guide. Insert any additional duties or expectations that may accompany this compensation increase. Please sign below to indicate your approval of the above changes and return this document to the Human Resources Department. If you have any questions at all, please do not hesitate to call me direct at Phone Number or send me an email message at Email Address. ACCEPTED AND AGREED as of the date first written above. 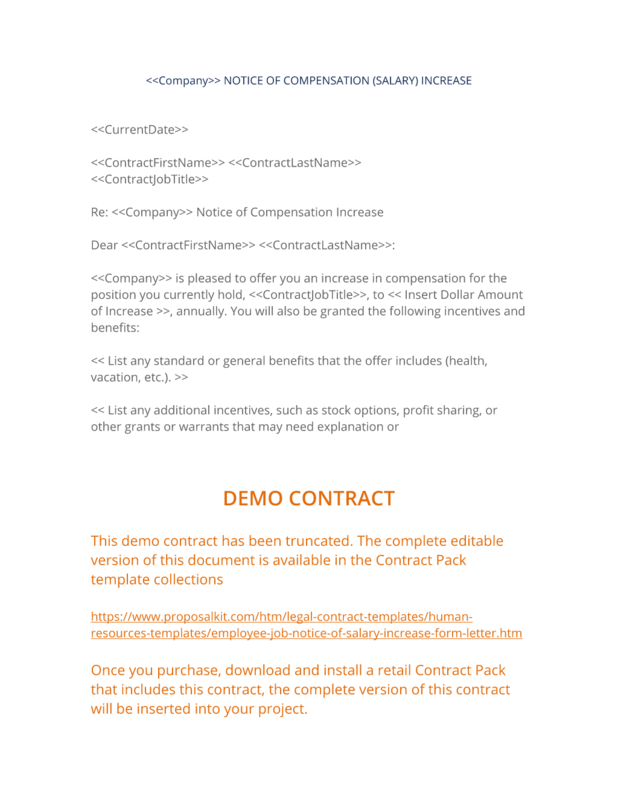 The complete Employee Notice of Salary Increase Form - with the actual formatting and layout - is available in this Contract Pack.